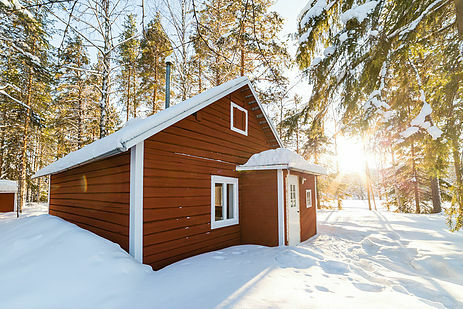 The Loggers Lodge is a private retreat for two hidden away in the Boreal forest of Northern Sweden. It's the ideal sanctuary for a romantic break or honeymoon leaving behind all stress and noise. The only people you'll come across are your hosts who are on hand to ensure your stay is just perfect - from the delicious menu prepared by your private chef, to keeping the sauna and hot tub at just the right temperature. Your time together and relaxation is priority as you sit back and relax, and watch the flicker of the fire or enjoy walks and winter activities in the surrounding woods. Arrive in Lulea, the coastal city in Swedish Lapland. In winter, Lulea is surrounded by the frozen sea ice and snow covered trees glistening in the sun. The compact city has a lot to offer when it comes to exciting winter activities and museums showcasing the local history, art and culture. Your luxurious Swedish winter adventure will begin with a private guided transfer from the airport. Learn about the history and traditions of Lapland en route to the boutique lodge, taking in the passing winter wilderness. On route you will stop at the old church town of Gammelstad, a UNESCO world heritage site. The final part of your journey to the boutique Loggers Lodge is along a private tree lined, snow covered track. This is a truly magical arrival, one that is fitting for this luxury lodge. 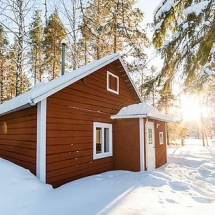 The remote lodge is a private, all inclusive, Swedish timber cabin located in the middle of the forest. Once at the Loggers Lodge you will have time to unwind and relax as you desire. Your private host will be happy to accommodate your every need. In the evening you will enjoy a well deserved three course dinner followed by a relaxing visit to the wood-fired sauna. Start your day with a hearty breakfast served by your private chef. Spend the day at leisure or choose to participate in optional activities such as dog-sledding, ice-fishing, snow shoeing, skiing and more. You can also spend the day as relaxed as you wish and choose to unwind in the outdoor hot tub. Enjoy another morning with an a la carte breakfast prepared to your liking. Choose to spend your day as active or relaxed as you wish. Make the most of your time in the arctic by selecting a range of activities, that your private host will tailor as part of your remote adventure. In the evening you will enjoy another traditional Swedish Lapland gourmet dinner made with organic and locally produced ingredients. Enjoy one last a la carte breakfast in your lodge before your private transfer to the airport. Bid farewell to Swedish Lapland and board your home-bound flight. If you're not ready to leave, why not extend your stay with a visit to the Treehotel or ICEHOTEL. We'll be delighted to customise your holiday to your wishes. Exclusive access to our client website at www.arctic-collection.com where you’ll find destination guides, practical tips, Arctic Library and pre-trip inspiration. This holiday is available all year round. Just get in touch with our team to find out more.